OTI Holding Board Chairman Ayhan Bektaş received the most successful businessman of the year prize from European Union Minister and Chief Negotiator Mevlüt Çavuşoğlu at the 24th anniversary celebrations of ANSIAD held in Antalya Ramada Hotel on January 18 with a group of 300 invitees. 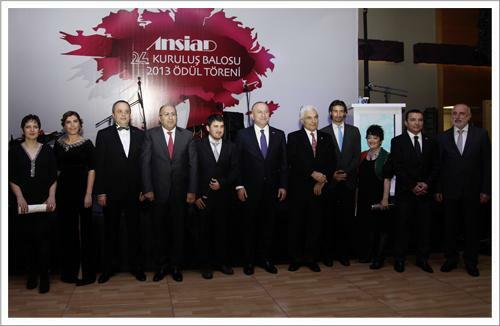 At the night participated by Deputy Minister of Culture and Tourism Dr. Abdurrahman Arıcı, Deputy Governor of Antalya Turan Eren, numerous members of parliament, and Antalya Mayor Prof. Dr. Mustafa Akaydın in addition to European Union Minister and Chief Negotiator Mevlüt Çavuşoğlu, OTI Holding Board Chairman Ayhan Bektaş stated that it is necessary to trust in Antalya's potential. Stating that its trust in Antalya’s potential has played an important role in OTI Holding's success, Ayhan Bektaş said, “The entire OTI family from our board members to our guides, from our hotel employees to our top executives has a share in this prize, and this prize is the common pride of all of us”.